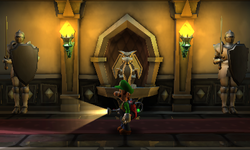 The West Gallery is a room in Treacherous Mansion in Luigi's Mansion: Dark Moon. It's accessible via the left door in the Front Entrance or the right door in the Dark Age Exhibit and connects the two rooms together. The room itself has two suits of armour (one near the left door and one near the right door), a carpet Luigi can roll up with the Poltergust 5000 and a single gargoyle attached to the wall between the two suits of armour. From A Train to Catch onwards, the suits of armour in this corridor will swing their swords at Luigi to try and hurt him. The gargoyle will also be invisible, revealing it with the Dark Light makes money appear. This page was last edited on September 24, 2017, at 04:01.